Instead of just discussing the way Other Burbank decided to depict the Hunchback characters against the book, we’re going to look at them against the 1939 version since this version blatantly ripped off that version. Is that fair? Who cares they brought it on themselves. Just to recap, Frollo in the 1939 version was the King’s High Justice who held himself to a godly standard, hated Gypsy and ignorant, like the Earth being round. He also conducted himself with elegance and grace. This grace and elegance were in line with him wanting to stay in control of his crazy emotions with regards to Esmeralda which of course he didn’t do. 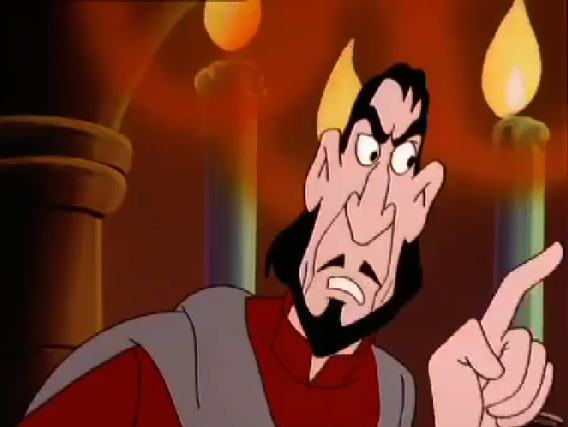 Frollo in this Burbank version is also the King’s High Justice and he also ignorant but that pretty much end the comparison. It is pare for the course for Frollo to have Esmeralda arouse his emotions so it’s not a major accomplishment that this version has the plot. He also were red agin like the first Burbank version (Australia doesn’t like black?) 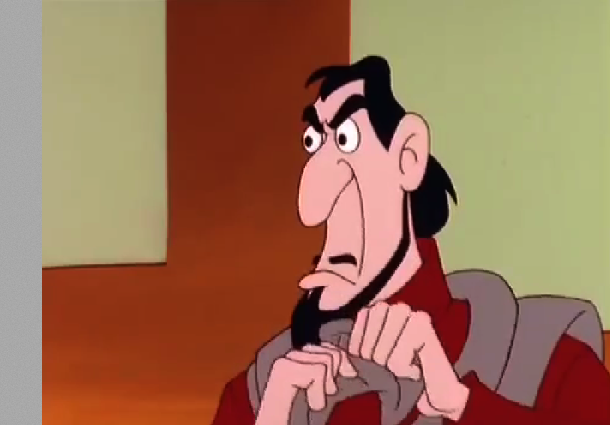 and he looks likes Disney’s Jafar and Gargamel’s love child. He was raised to want power and Smurf Berries. 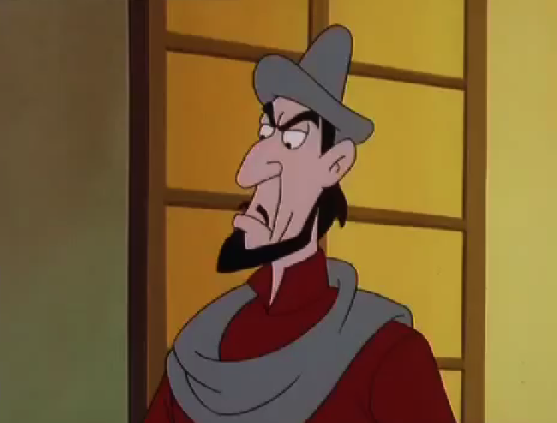 Frollo just comes off cranky, dour and unpleasant. He doesn’t express any pathos or darkness an therefore he boring, very boring, like ambien, he curse insomnia if can stand to watch this for 40 minutes or if your brain doesn’t implode. 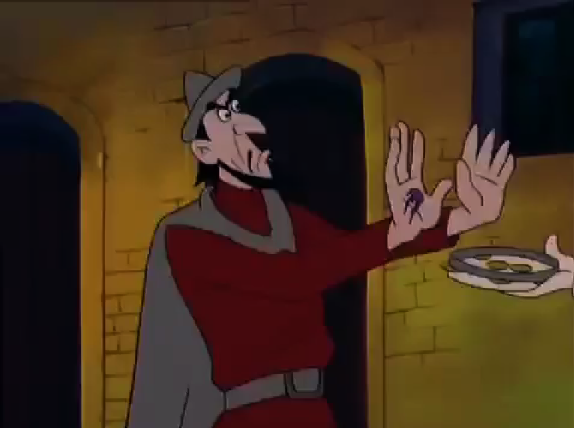 Frollo in this version seems like a bargain-bin Saturday morning cartoon version. Wait, actually that would be a step up since this a straight to video preemptive Disney Knock-off which is as low as you can go in the totem pole. 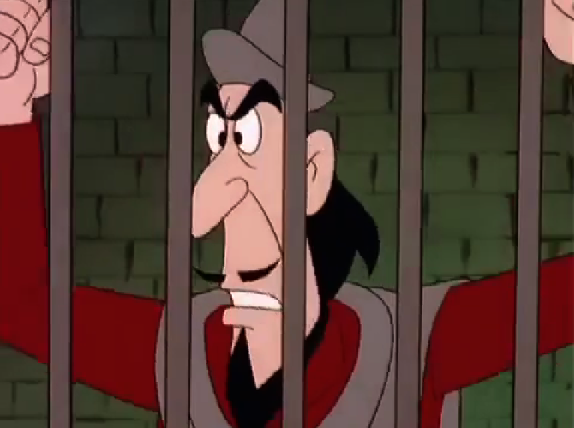 The sad truth is Frollo is probably the closet to the 1939 version characterization.